In an ominous backdrop to the recent political turbulence in Iraq and mass arrests yesterday of scores of employees of Finance Minister Rafi al-Eisawi of Iraqiyya, the Iraqi electoral commission IHEC has rather silently confirmed that Prime Minister Nuri al-Maliki is beginning to shape a big sectarian alliance for the purpose of contesting the local elections in April 2013. IHEC continuously updates its list of newly formed coalitions, but the latest addition yesterday of an entity referred to as C26 is surely the most momentous so far (and probably the last one, since 20 December was the extended deadline for registering coalitions). The name of the coalition is State of Law, and its head is “Nuri Kamil Muhammad Hasan”, aka Prime Minister Maliki. The really important thing, though, is the scope of the alliance. Not only are the usual suspects from the various Daawa parties, the “independents” of Vice Premier Hussein Shahristani and the Daawa breakaway faction of Ibrahim al-Jaafari included. Here are also Badr, Fadila, and several smaller Shiite Islamist and (Shiite) Fayli Kurd parties. The only slightly unexpected inclusions are Jamal al-Batikh of the White breakaway movement from the secular Iraqiyya and Iskandar Witwit, also formerly of Iraqiyya. Then again, these are (secular) Shiites, meaning that the overarching theme here is the failure of Maliki to coopt the many Sunni breakaway factions from Iraqiyya who share some of his ideas in the ongoing dispute between Baghdad and the Kurdish federal region. Instead Maliki is relying on a ragtag of smaller parties who stand out mostly for their Shiite sectarian outlook, including some truly unsavory elements like the Tanzim al-Dakhil branch of the Daawa party headed by Abd al-Karim al-Anayzi. The only major Shiite parties that are not included in Maliki’s new list are ISCI and the Sadrists, the latter having announced a coalition of their own. [Update: “latter” in previous sentence refers to the Sadrists only, not to both. In latest IHEC, ISCI and Sadrists each have little coalitions of their own, named Muwatin and Ahrar respectively.] To some extent, it may be a healthy tendency that all these three groups should remain in competition in the governorates south of Baghdad. However through this act of coalition-forming, coming on top of the recent decision to create purely Shiite alliances in Shiite-minority governorates like Diyala and Salahaddin (some say also Nineveh but not confirmed by IHEC yet), it is clear that Maliki will not be using the local elections of April 2013 to build bridges to Sunnis and secularists. At one point it was rumoured he even tried to get ISCI included in his coalition. The alternative of reaching out to some Sunnis and secularists wouldn’t have been altogether implausible. Already there were signs that the various Iraqiyya breakaway elements were fragmenting further into pieces that theoretically could have been partners of Maliki rather than opponents in places where there are mixed sectarian demographics or large secular electorates. One such alliance brings together the Nujayfi brothers, Dhafir al-Ani and Ahmad Abu Risha (rumours that the besieged Eisawi should himself have joined is so far only supported by a few secondary sources; as late as four days ago Eisawi was only discussing a possible alliance with Abu Risha according to his own website). Another more recent coalition includes Salih al-Mutlak and Qutayba al-Jibburi, from one of the many Iraqiyya breakaway factions that appeared earlier this year. But with the seemingly arbitrary arrests of people close to Rafi al-Eisawi yesterday, the effect seemed to be that Iraqiyya got some renewed unity as several of its leaders got together to support Eisawi. If Maliki uses the run-up to the local elections to persevere with his current conflict against the Kurds and intimidate Iraqiyya without building any bridges to disaffected Sunni Arabs in the disputed territories (and possibly also without having the diplomatic buffer of President Jalal Talabani whose health problems have deteriorated sharply in recent days), he will probably lack the parliamentary and political basis for such an escalation. If his approach remains unrealistic, the chances for violence will also go up. Every article I have published since February 2011 has been written against the backdrop of on-going police persecution and harassment of me initiated by the Norwegian government and supported by several other Western governments. Please visit my other blog for full details. Pan-Shiite Alliances in Diyala and Salahaddin: Sectarianism on the Rise in Iraq before the April 2013 Elections? After having approved the political parties allowed to run in the April 2013 local elections, the Iraqi elections commission IHEC keeps updating its list of coalitions as the various parties join to form greater alliances. The current list is very preliminary, especially since the leading Shiite Islamist parties have not shown their hands as regards what they will do south of Baghdad (where they use to fight against each other given the Shiite majority population). However, their alliances for two governorates with Shiite minority populations – Diyala and Salahaddin – have now been declared. In both provinces, they will run on a joint Shiite sectarian ticket including everything from ISCI and Badr via Daawa to Sadr. For anyone who is worried about sectarian tendencies in Iraqi politics, this development should give reason for concern. Suffice to say that back in the provincial elections in 2009, when the climate in Iraqi politics was considered at its most non-sectarian in the post-2003 era, Prime Minister Nuri al-Maliki ran separately in both places. Not only that, he played a role in challenging the other Shiites (chiefly ISCI) when the battle for the governor position in those provinces got going during the months following the election. 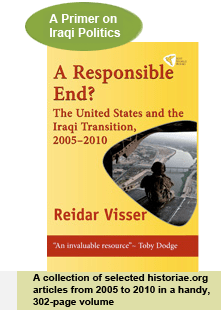 To those who are interested in an Iraqi politics defined in non-sectarian terms, the ups and downs of the relationship between the central government in Baghdad and the Kurdsih federal government in Erbil is not as worrisome as many analysts claim. As long as both parties stay within bounds, there is hope for a settlement, and the dispute itself often forces Iraqis in the central-government areas to rethink the relationship between their sectarian and national identities. On the other hand, what is happening in Diyala and Salahaddin regarding these new coalitions seems like miniature replays of 2005, when Iran played a key role in bringing together a unified Shiite coalition at the national level. Still, the most interesting part will be to see what coalitions the Shiite parties will form south of Baghdad over the coming weeks. Posted in Uncategorized | Comments Off on Pan-Shiite Alliances in Diyala and Salahaddin: Sectarianism on the Rise in Iraq before the April 2013 Elections? Until recently, a major problem regarding the forthcoming (April 2013) Iraqi local elections was a ruling by the federal supreme court which had deemed the current election law unconstitutional for its seat distribution formula. Previous revisions had failed to deal with the problem, but today it was solved. The Iraqi parliament voted to adopt changes to the seat distribution formula, taking it from a variant of the largest remainder principle to a formula that gives somewhat better hope for smaller parties: The Sainte-Lague method. The differences between the two systems had been accentuated under the former arrangement since only parties that had already won seats had the chance to win the “leftover” seats following the initial distribution. Sainte Lague is a method which is common in Scandinavia and Germany and several other countries. Hopefully, this latest change will not only satisfy the Iraqi federal supreme court, but also provide some better chances for smaller parties to gain representation come election time in April next year. A major problem in past Iraqi elections has been the large number of wasted votes cast for parties that fell just short of the thresholds for winning seats. Meanwhile, there are conflicting reports regarding the withdrawal of the bloc of Prime Minister Nuri al-Maliki from the session today just after the passage of the election law amendments. Some sources claim it had to do with unhappiness with the new election law; others claim it had to do with the next item on the parliamentary agenda – the contested federal supreme court bill. It will be interesting to see which explanation is correct. It seems logical that a big party should dislike a change for better representation, although the call for a change by Maliki’s friends at the supreme court had been quite clear. On the other hand, if rumours that State of Law wanted to go further with Islamizing the federal supreme court are true (some sources claim it insisted on a stronger clerical veto), it would mean a strengthening of the religious tendency that Maliki specifically sought to downplay in the last local elections in 2009. Whichever interpretation is correct, following the initial approval of political entities, the process of joining parties into coalitions for the April elections is now slowly beginning to get underway and will likely provide the best answers about the overall direction of Iraqi politics.